The question I most often hear from young mothers during post-partum consultations is this: “How to calm the baby down? Are there golden remedies to use when he or she is crying?” The answer seems to be obvious: YES. It should be noted, however, that golden remedies won’t work with every baby. In this document, I will describe the methods I most often use in my job. An acknowledged American paediatrician, dr Harvey Karp, after many years of studying the behaviour of newborns, came up with certain conclusions. Most importantly, we come into the world 3 months too early. Since human heads are disproportionately big, if we remained in the womb for another 12 weeks, and our bodies grew at the same rate they do until the 40th week of pregnancy, the size of the head would make natural birth impossible. It is thus necessary for children to be born before they are ready to meet the world. This is why so many things “scare” them and make them anxious. So, what shall we do when our baby won’t calm down, even when sated and dry? First of all, we should recreate the environment he or she is used to – the mother’s womb. Dr. Harvey Karp proposes a method he calls 5S: swaddling, side-stomach, shushing, swinging and sucking. Swaddling. Newborns don’t like having too much space. It is recommended to limit it somehow, so that it feels as tight and cosy as an uterus. The baby’s arms and legs should stick close to the body. Newborns are incapable of controlling their arms. They keep swinging them, becoming increasingly excited. This, unfortunately, prevents them from falling asleep. 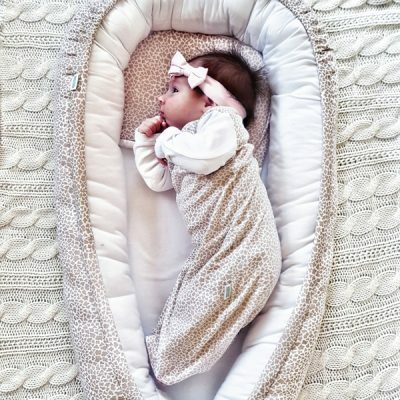 Babies can be swaddled with blankets, diapers made of cloth or cotton, or special swaddles. Side-stomach. Simply put, this step is about positioning the child in the most comfortable position. It is advisable to hold the swaddled baby in an extended hand, lying on its side or belly, facing down. Shushing. Children develop hearing in the 4th month of prenatal life. The first sounds they hear are their mother’s heartbeat and the shushing of blood in the umbilical cord. Fortunately, we are capable of recreating these sounds. The shushing – or the white noise – can sometimes be generated by toys (shushing teddy bears, chickens, pillows, etc.). It can also be downloaded onto mobile devices with a special application. White noise calms not only babies. It works just as fine on adults. It even eases migraines (I know from experience). Truth be told, swinging should be mixed with jumping. Place the infant on your forearms. Swing vigorously. Make sure the head is stabilised. Swinging can be mixed with sit-ups or hopping. This stage can be modified. If the baby shows signs of disapproval, we need to put it on our knees and swing smoothly. The head should gently swing from one side to the other (similar to the toy dogs or cats you sometimes see in cars). Sucking. This never fails to soothe a baby. Works with breasts and pacifiers. These methods will help your baby calm down. There is something we need to keep in mind, though. No other person or object can replace the baby’s parents. You should therefore spend as much time as possible with your child. In doing so you establish a strong bond with it and fill yourself with endorphins – a rare commodity these days.